I am still looking for Kevin. I think he is a big part of this case. I can find several, but none are young guys. My Life has 2 - one 37 in Chichester, NH who is Kevin J. The other one is Kevin D, 47, of Bedford. Is it possible his name is something else, but he goes by Kevin? Maybe Kevin is his middle name? A photo would be sooo helpful. Who was it that was on here talking about seeing Wendell's photos on FB? If someone could look at those there is supposed to be a photo of Kevin asleep at the bachelor party and the "ladies" working him over. It was referenced ina message from Wendell to "Bobby" IIRC. I thought Kevin was only 18? Maybe that's why he's not out there with people searches & such. He's lived with Louisa. Maybe he hasn't been out on his own to form credit yet? Idk, just speculating. I saw that fb comment on Wendell's wall about the girls having fun with Kevin. I kinda wished it wasn't the Mullaney one that Celina calls brother. According to Wendells fb wall, he got married last October 2010. When is Kevin's bday? If anyone has access to Wendell's fb photos, maybe they could print out those pics & send them to the FBI. Seems like it's a small town where everybody knows everybody. If Kevin had alcohol with Wendell, then Wendell could be brought in and charged for it. If hookers had their way with Kevin and there's pics of them grabbing & kissing him, then Wendell could be charged with endangering the welfare of a child if Kevin was underage. The reason they need to be printed out is so the FBI has the complete URL in case it gets deleted. They sjould make sure it has today's date somewhere, too...or the date they're printed out. Either way, if Kevin really is only 18 right now, then he's still underage to drink. Anybody have access to his photos? I copy & pasted all of his friends, info and wall & put it on the pictures & social media thread. I didn't supply the links for the friends, though, bc some of them are attached to spam & all are X-rated. People can just search the names. The lack of answers was "scary," said Shannon Towle, who owns a convenience store across the street from the house where Celina lived with her mother, sister, stepfather and a man named Kevin Mullaney, said by neighbors to be the son of a former boyfriend of her mother, Louisa Noyes. Earlier Tuesday, investigators combed the area along the river, which divides Vermont and New Hampshire, above where Celina's body was found. A crime scene technician said they were doing computer-aided diagramming to give them a precise electronic image of the area. You can do a reverse address on people smart and it will give you ages and relatives, this is why it is called "smart"
www.peoplesmart.com "reverse address" if case the link below can not be retrieved. Thanks Seahorse! I've never used this before...I think? Haha! This is Kevin's facebook page but he's not using a real picture of himself on it. They're fos. As soon as they saw her body they said it was suspicious. I think they're waiting on more evidence, to process & secure it, then get the culprit. IMO, their town has already been turned upside down, they're probably trying to prevent a stampede. Have y'all read the comments on Tyler Noyes' FB wall? In particular, the 8 comments posted on Monday? Very interesting. I didn't cut and paste 'cause I figured it'd be bleeped for language. Now see I read what Tyler has to say..but I also read what someone else said first. He is just taking up for his family. I don't think that exchange is unusal for his age..I do think that someone calling him out about Wendall is not called for since Wendall is his uncle right, not him. I mean how else is this kid supposed to react? Thanks cw618, it sure does need a fixup. Unfortunately, Wendells pictures are not for public view. Or maybe fortunately. Something is really bothering me about this Sharon Towle..she has been front and center throughout all this..talking to reporters everyday..mentioning her business..mentioning how she feels....yet she was talking about the vigils every night before..now she's scared. I would really like to know what this woman has done for the family during this..and the town and the searchers..she seems to me like someone I would not like..running her mouth, making sure to promote her minimart business and not much else. 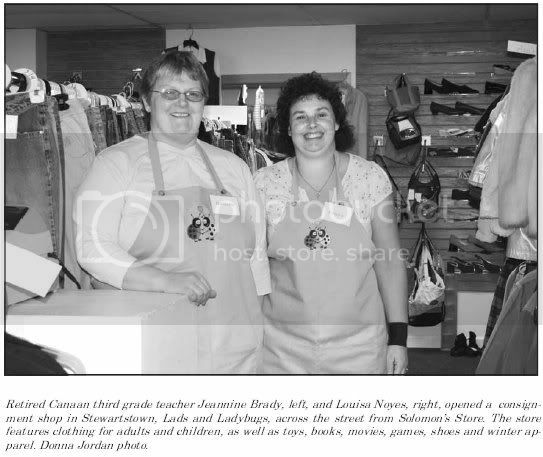 Here is a photo of Louisa on the right at the consignment shop where she works. This was taken Dec 2010 and is from an article in the Colebrook Chronicle. She looks young, pretty, happy and normal here. Not what I was expecting at all. The photo and article about the shop are on page 6 of the pdf below. I tried to insert the photo, but it didn't work so I guess I don't know how to do it. If anyone could tell me how or insert it for me I would appreciate it. Wasn't Celina reported missing on a monday and didn't stepdad say he called Mom at work to tell her........on that same Monday? July 25th was a Monday and the shop is closed. It was at 9 p.m. that night that the family said they last saw her on her computer in her room. So her mom wasn't in work that day. The next day, July 26th, was a Tuesday, which is the day stepdad found her missing and her mom would have been at work since the shop opens at 9:30 a.m. on Tuesdays. I'm more curious about early that morning before stepdad says he saw her missing. I wonder what time he got up that day. Does anyone remember the time he posted something on his Facebook page (since deleted)? If it is true that Celina didn't sleep in her room that night, maybe he noticed her not sleeping on the sofa. Otherwise, why would he be looking for her so early during the summer when she didn't have to get up early for school? The woman said that she would be surprised if Celena slept in her own room because she didn't like to if her sister wasn't there. But this woman doesn't know where she slept for sure - it was just an observation on her part. Yet the parents say that the last time that they saw her was in her room. So that tells me that they should assume that she did sleep in her room since that was the last place they saw her. Otherwise they would have said that the last time they saw her was sleeping on the sofa. So then why would stepdad go looking for her? It seems like he would just assume that she was sleeping in her room. I know what I'm trying to say - is this making any sense to anyone? You know what? 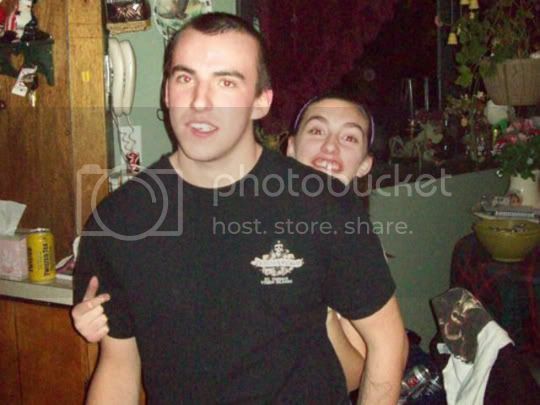 Some reports say that Wendell called Louisa at work to see where Celina was or to let her know she wasn't in her room. Other reports say that Louisa & Wendell both discovered her missing. I know it's verified Kayla went to somebody's house to see if her sister was there & that person called 911. It's been reported that Louisa & Wendell called the state police but some articles sort of contradict that. Was Louisa at work or not? If she was, then why wouldn't she check on her daughter before she left for work? I typed in no first name, this guy came-up. We do not know if it is the "The Man"
It sure could be, but I can't get any other verification. The only other Kevin M Cass is NH that I have run across was from Colebrook (just down the road) and Concord, but was 38. STEWARTSTOWN, N.H. — Law enforcement officials looking into the death of an 11-year-old New Hampshire girl whose body was pulled from a river this week entered her home with a warrant Wednesday and impounded her stepfather's pickup truck, as her mother began making arrangements for a private memorial service. New Hampshire State Police loaded the late-model silver pickup truck onto a flatbed, and gloved crime scene technicians examined its undercarriage before it was hauled away. Mullaney and Celina's stepfather, Wendell Noyes, have previously run afoul of the law. Mullaney was charged in a string of car thefts in 2007, and Noyes was arrested in 2003 for breaking into an ex-girlfriend's home and threatening to throw her down a flight of stairs, according to court documents. Wendell Noyes was involuntarily committed to a psychiatric hospital after the 2003 incident, and an order signed by a probate judge indicated he suffered from paranoid schizophrenia. Mullaney pleaded guilty to stealing five cars and trucks in 2007 and was sentenced to 1 1/2 to 3 years in prison and a consecutive term of four months in jail. Friends close to Louisa Noyes say Mullaney, 23, is the son of a former boyfriend and moved into the Noyes' home about a year ago, joining Wendell and Louisa Noyes and her children, Celina and her older sister, Kayla. Gypsy ~ Literally, all I meant was that it was very interesting to me. I think the kid was goading Tyler. Remember, too, that's where Wendell headed to buy his cigarettes yesterday, after his hospital dismissal. Page created in 10.268 seconds with 19 queries.